The Bulle MOLLE multifunction utility pouch is a multi-pocket organiser pouch which opens to a maximum of 90 degrees allowing its contents to be displayed neatly and ready for use. The pouch opens on all three sides via a YKK double zipper to reveal two halves with identical pockets. The pockets on each half are: flat pocket, two expanding pleated pockets, wide 40mm elasticated band across expanding pleated pockets. 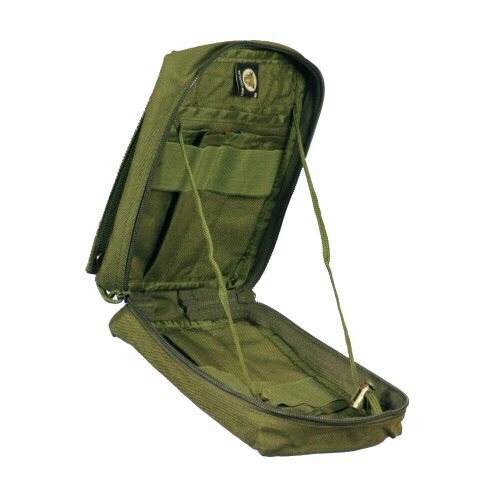 The pouch is hinged at the bottom and its degree of opening may be adjusted via two UTX-Flex branded toggles on the half which is not mounted on the MOLLE base. The front of the pouch is provided with MOLLE cross webbing to take additional small pouches, such as single magazine pouches, double pistol or utility and multi-tool pouches. The zipper pulls are made of nylon cord with UTX-Flex branded terminals which eliminates excessive noise associated with traditional metal pulls. These are also capable of easy field repair if they become burnt or snagged. 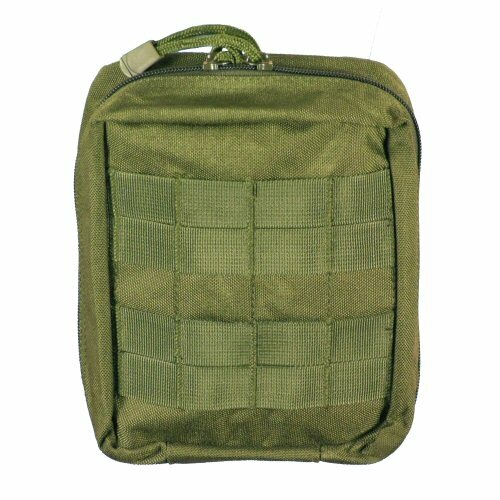 This is a fully featured pouch which comes with its own MOLLE mounting straps, terminating in push buttons on the body of the pouch. The drop-down tray feature makes the multifunction utility pouch is an excellent way of organising many small utilities into one carrying system, and is an excellent alternative to one size fits all utility pouches which only feature one main compartment. Made of 1000D texturised Cordura. Price is for ONE pouch. 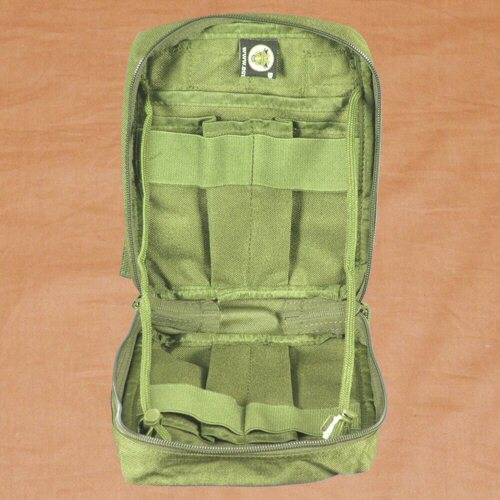 Due to the slightly over-length MOLLE mounting straps, the pouch is offered at a lower price compared to our other multifunction utility pouches. Any accessories shown are for illustration purposes only and are not included with the pouch. Pouch overall dimensions are: 14cm wide, 17.5cm tall, 6.5cm deep. Inside top view of the Multifunction Utility Pouch. The elasticated securing straps on the inside are clearly visible her. These can be used to secure items such as bandages, scissors and eye wash. The pouch also features a draw-string system, whcih allows the pouch to be unzipped and hung open at varying angles, depending on the position of the chord. There are pockets in the back sections of each side of the pocket, which allow items to be placed inside. These would typically include items such as plasters, flat bandages, or possibly a small spade. 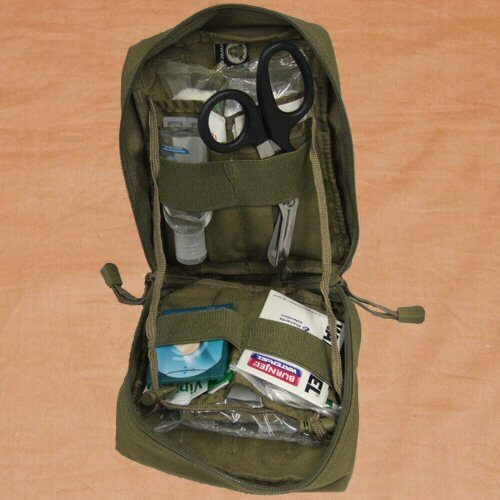 Detail showing the pouch loaded with first aid supplies. Plese note: note is for one pouch only. No supplies provided.